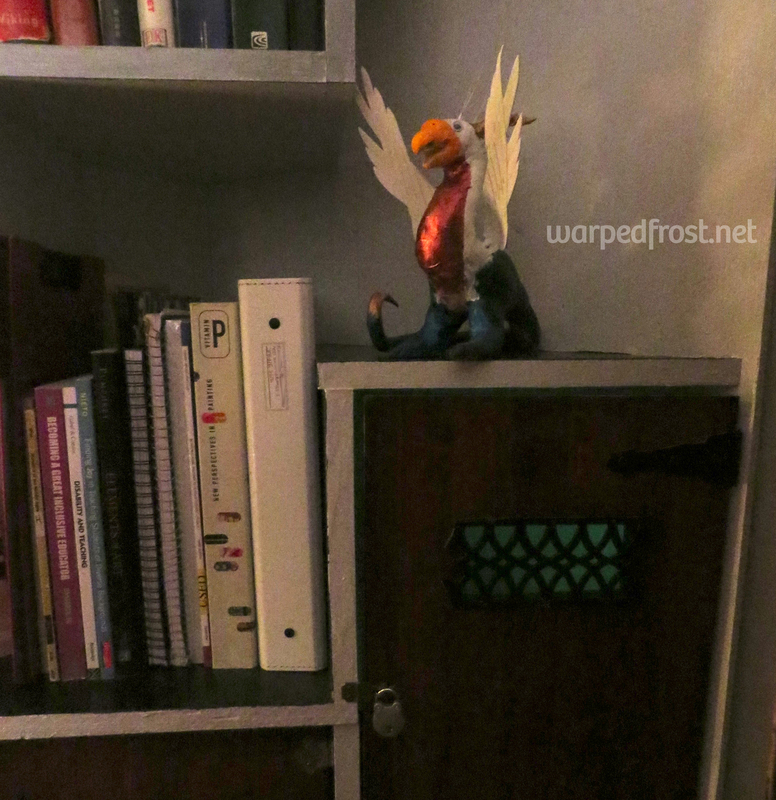 When I first introduced my project to make an unusual bookshelf, I mentioned that it ultimately was to go in a particular corner of my room. While I’ve already unveiled the finished product in the post about my program’s exhibit this past June, I wanted to show what it looks like in situ. Unfortunately right now I can’t move the brown cabinet on the right so it’s cramping The Alchemist’s style a little bit. 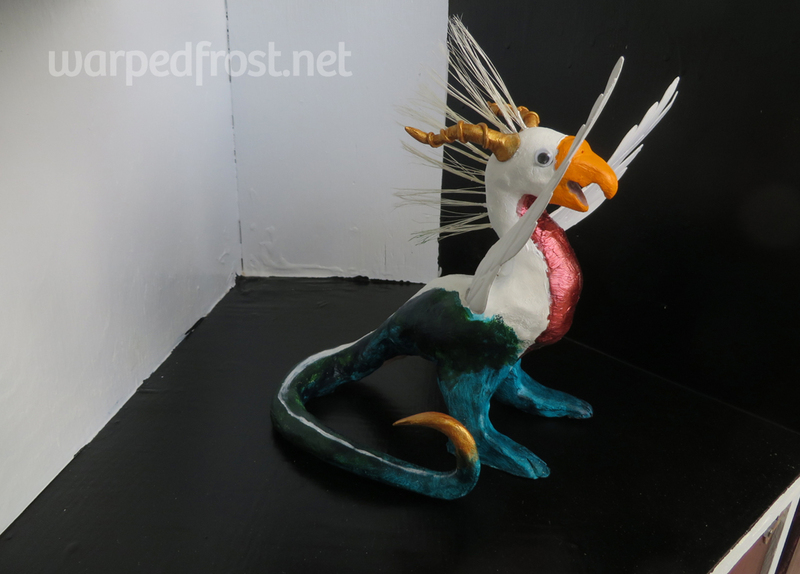 I also made a little chimera out of clay to be locked up inside the “Chimera Closet” (the tall compartment on the bottom) but…once you put googly eyes on something, it’s too cute to keep it locked up. It was hardly visible through the grate in the door anyway, so it wouldn’t have had the desired effect. 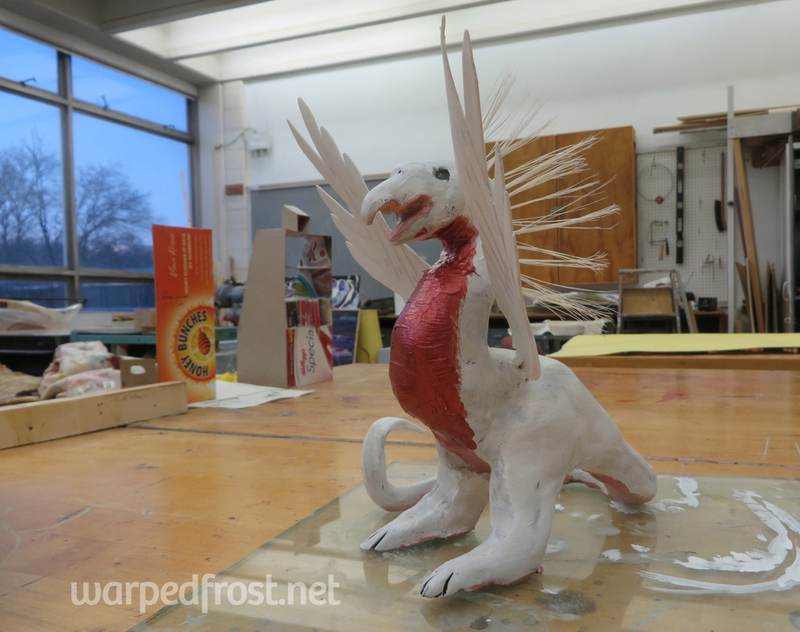 I needed to have made it smaller, but this was my first time in probably more than a decade working in clay so I couldn’t handle it skillfully. 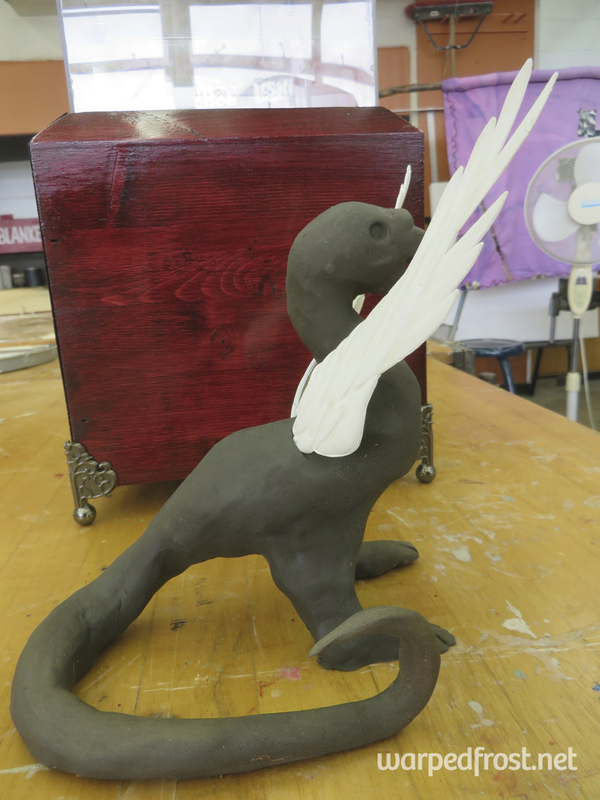 The main inspiration for it was the basilisk. Made with self-hardening clay. The wings were from an old Wing Zero (from Gundam Wing) model kit. One of my brushes fell apart, so I gave the chimera a Mohawk made from its bristles. The finished chimera, painted with acrylics. I sprayed the inside of the Chimera Closet with glow-in-the-dark paint. What I had in mind originally was supposed to feel creepy rather than kinda silly which is how it turned out. Believe it or not, that beautiful grate on the Chimera Closet was a piece of cut wood that my professor found lying around in the wood shop. It was a bit warped, but I flattened it out by leaving it inside a vise for a couple of days. Some black spray paint & clear coat later and it was good to go, matching the black hardware I’d bought new. Speaking of hardware, although it might not be terribly clear in the photos, the hardware that isn’t black on the bottom doors of the bookshelf were shiny new brass, but I antiqued them all because I didn’t want anything gold-colored on the lower levels. After all, the metaphor here was alchemy/refining oneself through books, so having gold (the goal) on the bottom wouldn’t have meshed well with the concept. 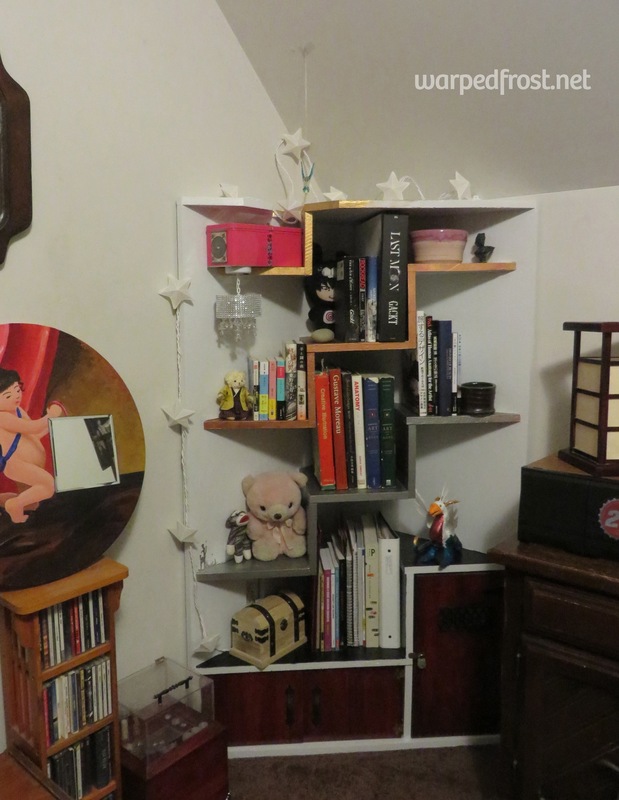 Originally I had wanted the bookshelf to go all the way to the ceiling, meaning I would have had to make a compartment that was a triangle on the bottom and a shape I couldn’t wrap my mind around thanks to the sloping walls of the “attic” ceiling above. So that got nixed. 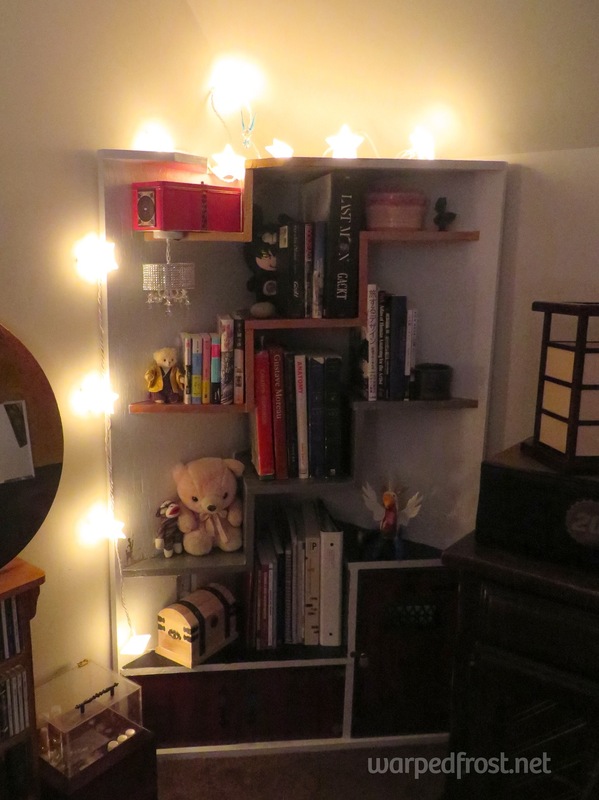 Instead I put star-shaped lights around it. Which makes this look even more juvenile than the googly-eyed chimera made it look, but…meh, it makes me laugh. 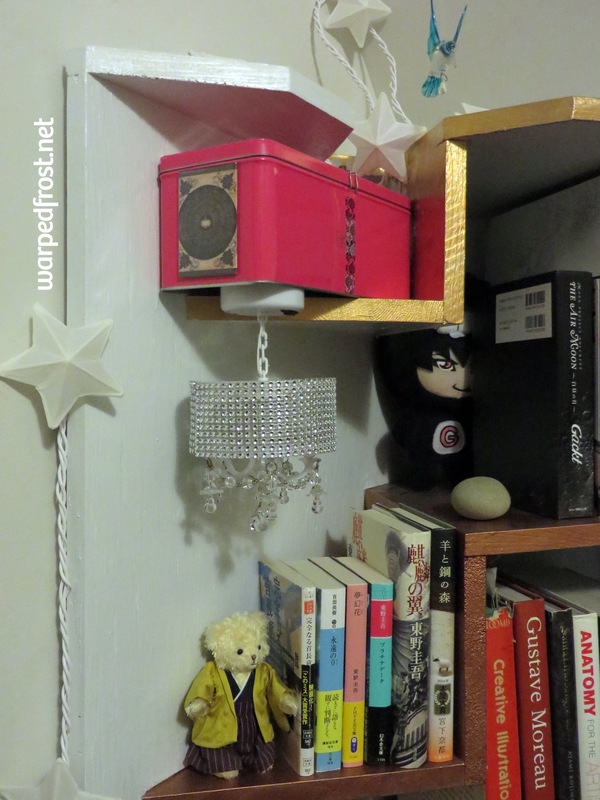 Anyway, I’m particularly fond of this little corner holding all the Japanese novels I currently own, with a Gakucchi hiding back there next to The Air Moon and LAST MOON. Half my Japanese novels are mysteries by HIGASHINO Keigo. ♡ Currently reading 「夢幻花」(Mugenbana, meaning something like “Dream Flowers”…that might not be the best translation but as I’m only about a quarter of the way through I don’t know what would be better). One thing I hadn’t considered as I was building this was that the side risers would only be able to hold very small books, as there aren’t many books that are 12 inches high but only 4 inches wide. This means the center risers end up looking very heavy while the side ones are nearly empty. The little corner above avoids that imbalance by having the chandelier hanging down from the riser above (each “flight” is shallower than the one below it, which is why the pink metal locker can stick out from the highest riser while still being inside the casing). I’ll have to try similar things on the other outer risers to achieve a more balanced look. Overall, however, I’m pretty satisfied with how this turned out. I built another bookshelf after this one, a more “traditional” design with flat shelves, and it was so monumentally easy after having done this one. In my final reflection for this class, I had to answer a question about how I would use what I learned as an art educator. I’d like to end this post by quoting a big chunk of that reflection paper, as I think it was probably the most important abstract knowledge I gained from doing this. One thing I started thinking about was that scaffolding doesn’t necessarily have to be done in small steps that the student can take. 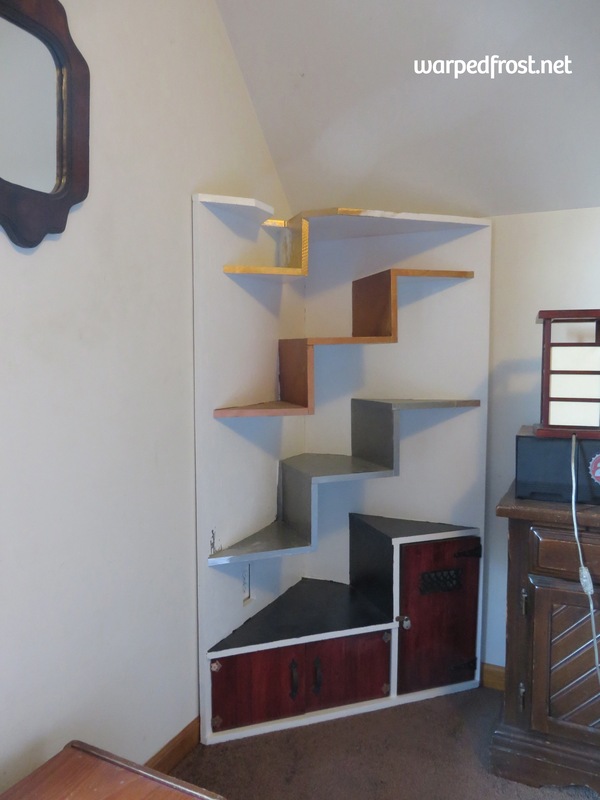 Common sense says that people who have never built furniture before shouldn’t pick triangular bookcases with stairs for shelves as their first project in the medium. I was so clueless about the whole endeavor that when I went to Lowe’s to buy wood and the young man at the cutting counter asked me how I was going to put the outer casing together I literally laughed and said “I have no idea.” But the reason I was able to take this plunge was, I believe, that I knew that someone somewhere would tell me what I needed to know. One way to explain this feeling while continuing the scaffold metaphor is to say that normally the steps on the scaffold are made small enough so that students can climb them on their own, whereas I had bigger steps but knew there was someone who would give me a boost up. Or, to use a metaphor with the reverse direction, I think it’s important for teachers to get to know their students to determine whether they need to go down the bunny slope or would enjoy getting thrown off the grown folks’ mountain and breaking a few bones along the way. Tags: bookshelf, clay figures, corner bookshelf, custom furniture, scaffolding, teaching. Bookmark the permalink.